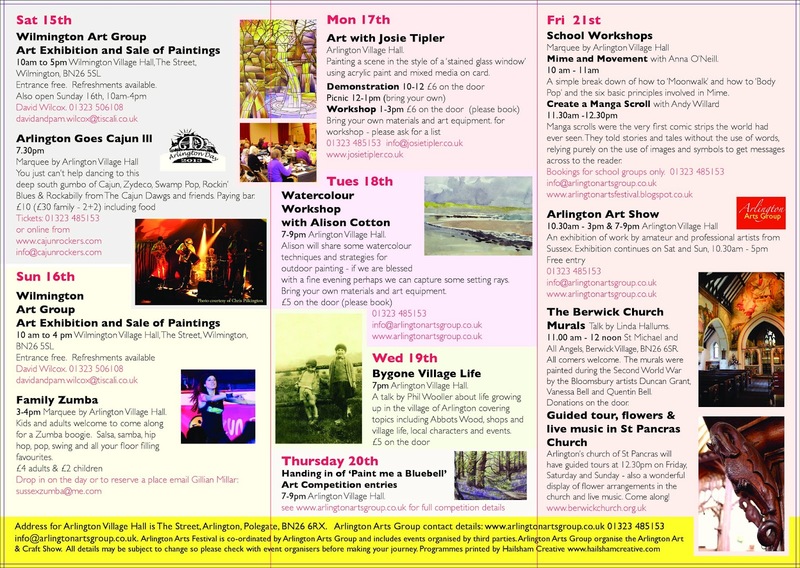 The Arlington Art & Craft show will be on 10th and 11th May 2014 - booking details will be on the website in the new year. 15th to 23rd June. Some events need tickets in advance so don't delay, check out the events today! Charities and local community groups (not-for-profit) are invited to apply to have a free pitch in the field at this year's Arlington Art & Craft Show on 22nd and 23rd June for a fundraising sideshow. We are looking for sideshows and games that will enhance the event. You may also have items on your pitch to raise awareness of your cause. If you would like to apply, please EMAIL us before 1st June with details of your charity or group, the type of sideshow or game you wish to run, what you will be charging 'customers', how much space you would need, how many people will be 'manning' your pitch, any other materials or promotions you will have on your pitch. We will consider all applications and email you our decision as soon as we can. We already have a Tombola at the event so no more tombolas will be accepted. We can not provide any tables etc, you would need to bring everything you need. Setting up time is from 8.30-10 on Saturday, and from 9-10 on Sunday, the show is open from 10.30 - 5 daily. The deadline for inclusion in the printed programme has passed but we are still accepting bookings up until a week before the show. If you have already sent in your application and have not yet had a response, please email us for an update. Artists are invited to apply for hanging space for the Art Show which runs from 21st to 23rd June 2013. We are also taking bookings for pitches outdoors and inside a large canvas marquee for a Craft show, Author's Book Fair and for fundrasing sideshows on 22nd and 23rd June. 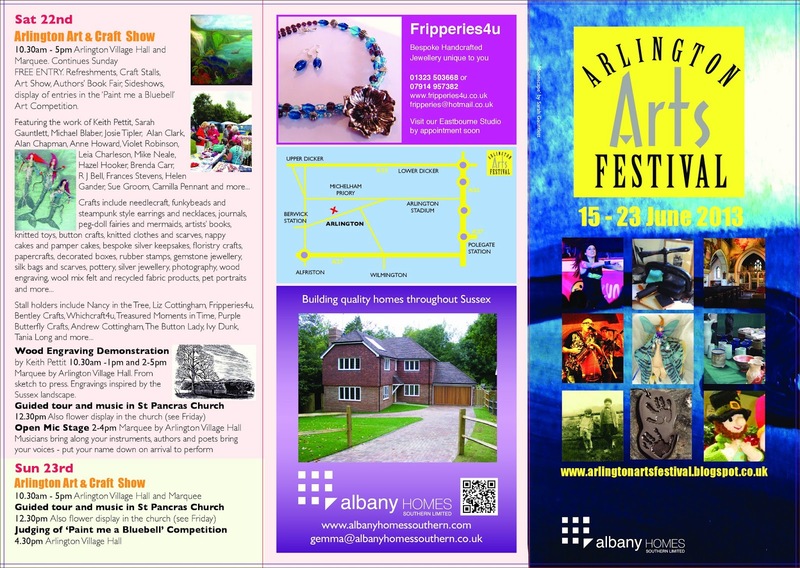 This event is part of the Arlington Arts Festival which runs from 15th to 23rd June. View and download the flier here. 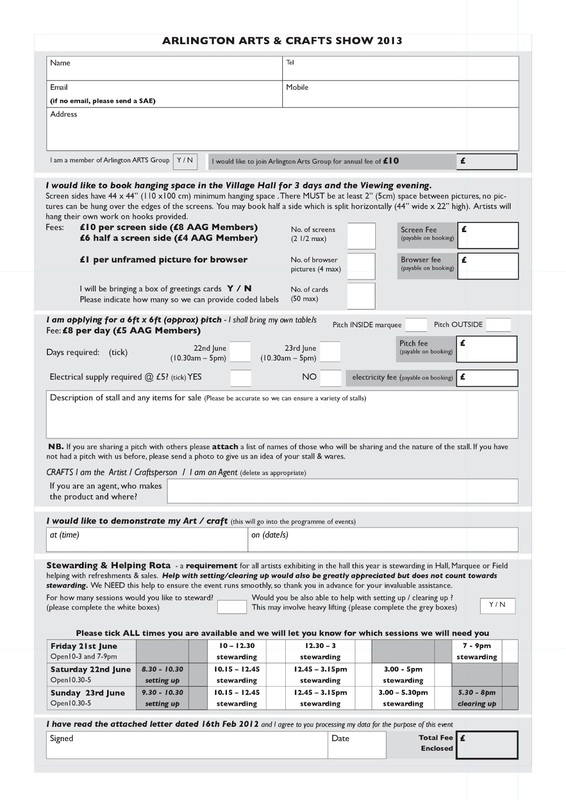 View and download the Arts & Crafts Show application form here. There is an accompanying letter HERE. Forms must be sent to the address on the letter. Hall for crafts, groups of artists, authors and for sideshows. event each day. Pitches must be vacated by 6.30 pm on Sunday. Any items left over night are left entirely at your own risk. or half screen sides (split horizontally) up to 2.5 sides per artist. The art show will open at 10.30am on Friday 21st June. wall space by prior arrangement. exhibiting and any other items you are leaving with us. Commission on all sales from the hall will be 10%. appropriate fee NO LATER THAN 2nd April. Cheque payable to Arlington Arts Group.